Experience the thrill of riding an Off-Road Segway along Door County's back wood trails and scenic country roads. "Thank you Rick! Rick is knowledgeable, flexible and adapts the tour to skill and interest levels. Exceptional!" 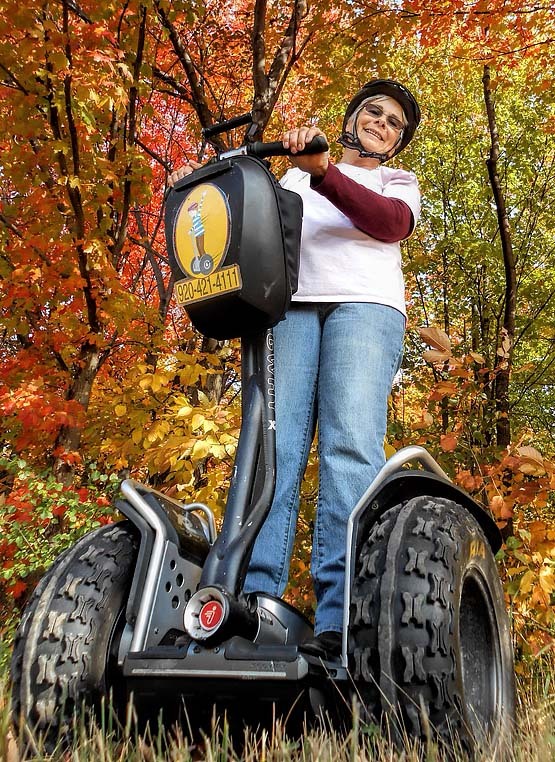 Have fun speeding through Door County’s backcountry as you ride an Off-Road Segway. With deep tread ATV-style tires, our bigger Segway’s handle terrain with ease – giving you a fun and smooth ride. Before you know it you'll have a smile on your face as you experience the thrill of your Off-Road Segway adventure. Experience the thrill of riding an Off-Road Segway to beautiful Sand Bay Beach located along the shores of Lake Michigan. During your tour, you will ride on 5-miles of off-road trails which meander through 100-acres of woodlands. Experience the thrill of riding an Off-Road Segway to beautiful Sand Bay Beach located along the shores of Lake Michigan — plus enjoy a Door County fish boil at Rowley's Bay Resort. Experience a smooth ride through Wisconsin's 3rd largest state park while viewing breathtaking vistas and overlooks of the park and waters of Green Bay — plus learn fascinating history of this beautiful jewel of Door County. "Your Door County vacation is about to get awesome!" © Offroad Segway Adventures. All rights reserved.